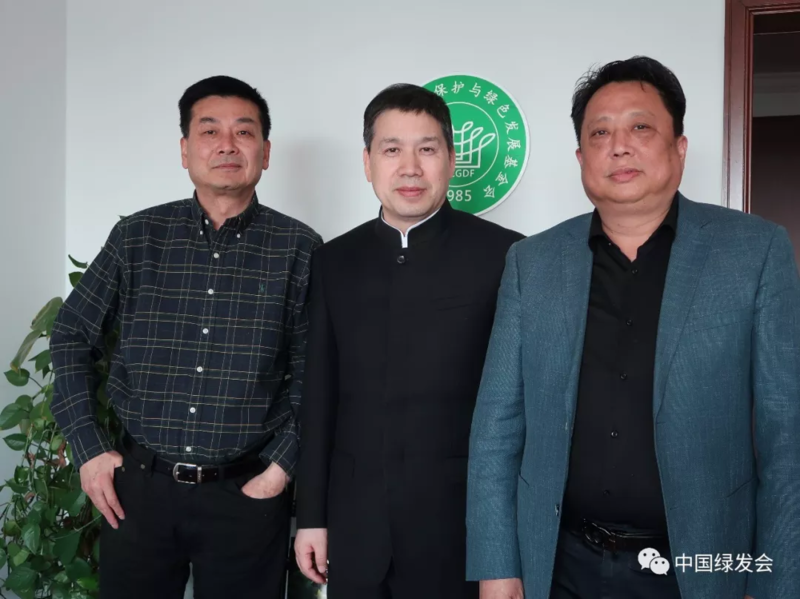 On April 2, 2019, the President of the Magazine “New Urbanization” Mr. Sun Ran and Vice Chairman of CITIC ZHENGYE Mr. Zhang Bin visited China Biodiversity Conservation and Green Development Foundation (CBCGDF) and had a fruitful exchange on the construction of an ecologically civilized city with Dr. Zhou Jinfeng, the Secretary-General of CBCGDF. Mr. Sun first introduced the purpose and focus of the “New Urbanization” magazine, and thoughts on running the magazine over the past few years. The “New Urbanization” magazine is headed by the National Development and Reform Commission and co-sponsored by the National Information Center and the China Urbanization Promotion Association. It is a comprehensive monthly publication specializes in China’s new urbanization issues, promotes China’s new urbanization achievements, and promotes China’s new towns. Its purpose is to research and promote China’s new urbanization construction achievements and experience, actively promote new urbanization with Chinese characteristics, and promote China’s urban-rural integration to explore new urbanization development services road. The two sides discussed the cooperation on the public welfare declaration with the theme of “green professional fields”. Mr. Sun introduced the “green professional fields” as a main concept, as a grasper, engaged in environmental protection, is a life attitude and proposition, emphasizing that human beings and nature are life communities. Being kind to oneself and being kind to the environment is the attitude and proposition of life in the “green professional fields”. Dr. Zhou expressed his appreciation and discussed with the guests how to effectively promote the green production lifestyle in the era of ecological civilization. During the meeting, Dr. Zhou exchanged with the visitors about the challenge and opportunities faced by running the magazine during the period of change, and the new urbanization in the new context of ecological civilization. He shared his experience in designing and advocating the China Guangcai Program as well as in contributing to the Contemporary Manager magazine, etc. in the early 1990s. He believes that the planning, standards and model cities of eco-civilized cities should be vigorously promoted. When talking about the history, practice, tasks and achievements of green development and ecological civilization, Dr. Zhou emphasized that the concept of “environment” cannot be equated with ecological civilization; the environment is only part of ecological civilization. In our actual work, we found that around the concept of “green”, there are a lot of errors in the operation of many places. For example, the 10,000-mu tree planting plan in Nanhui Dongtan, Shanghai. He suggested that in the era of the integration of traditional media and new media, to promote a more inclusive and harmonious society through "contention" and raise public awareness of ecological civilization. Dr. Zhou introduced the experience of studying the spirit of the important speech of President Xi Jinping during the NPC and CPPCC two sessions meetings this year, and the importance of eco-civilized urban planning, and from our perspective, how to promote China’s construction of ecological civilization to take a new step. Both sides agreed to promote the "Green Professional Fields" approach. The two sides should start cooperation in all aspects in the next work and implement and advocate the spirit of ecological civilization with more practical actions.